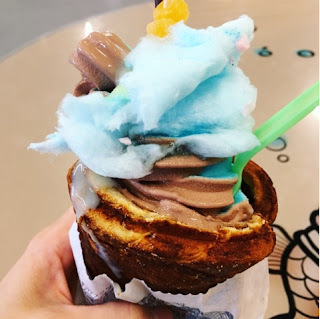 A close up of the soft serve taiyaki topped with cotton candy and a pocky stick! Taiyaki soft serve?! I'm there! 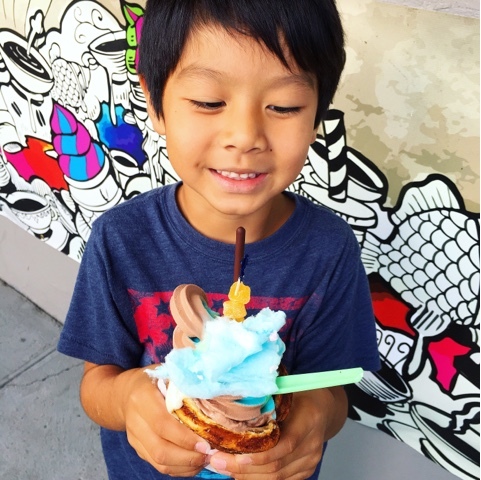 $5 gets you a yummy soft serve in a generous sized taiyaki - a fish shaped cake using pancake or waffle batter. Yoloha Café uses waffle batter and you can get it filled with chocolate, vanilla, or swirl soft serve. We really enjoyed the soft serve, but we wished there was more of it. While the taiyaki was a little messy to eat it was crispy on the outside and chewy on the inside. Located in the Waipahu Plantation Marketplace, Yoloha Café also serves espresso, coffee, boba drinks and even savory filled taiyaki like spam and egg! The café has some seating inside and this mom was happy there was a restroom too. 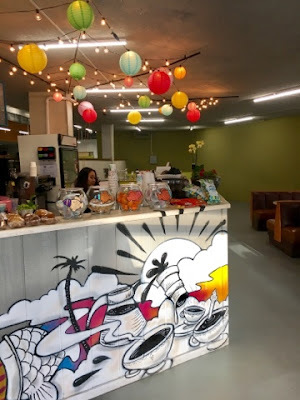 Open 7am to 7pm Monday thru Saturday and 9am to 5pm on Sundays. Service was fast and friendly. Check in on Yelp for $1 off! Love the décor of Yoloha! My son is all smiles with his soft serve!